Those of us who have lived in Bogotá for some time will agree that it is a bit of a grey city. Often cloudy, chilly in the evenings, extremely wet during the rainy season, it’s not the best weather you’ll find in Colombia! That said, Bogotá’s talented artists have done a wonderful job brightening up the city with stunning and thought-provoking street art. If you’re a fan of Shoreditch, East London, as I am, or just a fan of art in general, you’ll definitely want to explore more of the street art in Bogotá. Colombia is home to many indigenous tribes. La Candelaria. A gift shop full of souvenirs for you to take home. La Candelaria. A typical street in Bogotá’s historical centre, La Candelaria. Impact Hub, Chapinero Alto, Toxicomano? What a beautiful advertisement for a concert 🙂 Carrera 7 with calle 67, Chapinero. Sunday’s ciclovía, and a beautiful shield from the scaffolding! 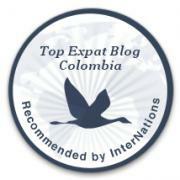 Hi Sanna, thanks for your comment and for mentioning my blog in your blog post! I hope you enjoyed the graffiti tour – I love the fact that it’s constantly changing as more new pieces of art are added to the streets of Bogotá!